Hartzer Consulting analyzed 3 .CARS domain names with live websites. We focused on website traffic, search engine rankings, and overall value of the traffic received by the car dealerships. Wichita.CARS and Phoenix.CARS were two brand new websites, while Arizona Car Sales moved their website from ArizonaUsedCars.com to Arizona.CARS. Should Car Dealerships Use a .CARS Domain Name? The dealership received $15,975 of organic search traffic value in the first year. The number of keywords that Arizona.CARS ranks for nearly doubled from 3,212 keywords to 6,236 keywords over a 9 month period. 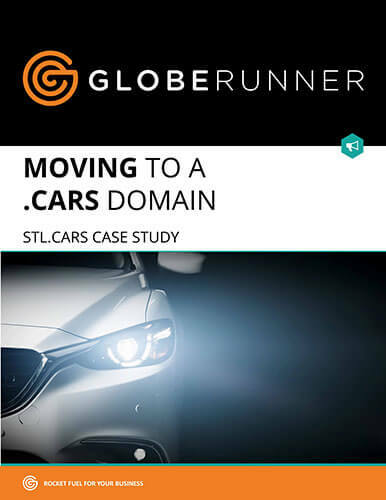 Santa Monica, CA – March 30, 2016 – A new dealership case study conducted by independent SEO experts GlobeRunner reveals that new automotive-specific domain names, .Cars, .Car, and .Auto (“.Cars”), are lifting search rankings, conversions, and traffic. Since launching in January, .Cars has been globally adopted by automotive businesses like UK-based marketer Motortrak.Auto, German technology company Pace.Car, and Massachusetts dealer group DCD.Auto. These websites join notable brands like Porsche.Cars, eBay.Cars, and Apple.Car. The GlobeRunner study analyzes a luxury dealership’s move from their existing website, www.STLMotorcars.com, to www.STL.Cars. This represents one of the first third-party studies conducted to examine the move from .com to a new domain extension. Other dealerships are also experiencing benefits by moving to new automotive domains. Brilliance Auto, a New Jersey-based dealership, migrated from BrilianceAuto.com (with a single “l”) to Brilliance.Auto. They also obtained keyword domains to expand their digital marketing: Certified.Car, Shop.Auto, and Safe.Car. “This study demonstrates that .Cars is poised to have a significant impact on digital marketing for dealerships,” said Mike Ambrose, COO of Cars Registry.